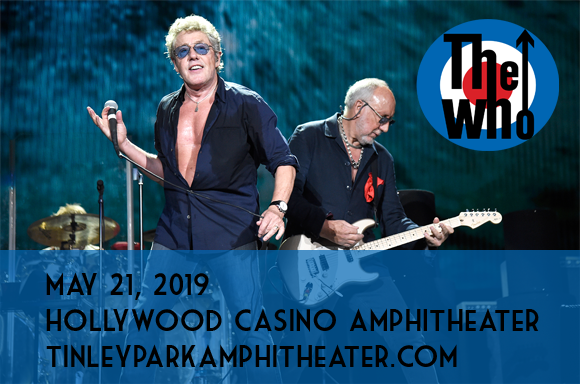 Iconic mod heroes The Who will perform at Hollywood Casino Ampitheatre on Tuesday 21st May 2019 as part of their Moving On! Symphonic Tour! With live symphonic accompaniment, the legendary band will perform hits from their beloved back catalog, plus fresh new material from their upcoming album – the band's first in 13 years! Formed in 1964 in London, England, English rock band The Who has sold over 100 million records worldwide and is considered one of the most influential rock bands of the 20th century. Best known as the classic line-up of lead singer Roger Daltrey, guitarist and singer Pete Townshend, bass guitarist John Entwistle, and drummer Keith Moon, the group was formed from an earlier group, the Detours, and rose to prominence as part of the pop art and mod movements. The group's debut single, "I Can't Explain", was released in 1964 and reached the UK top ten, followed by a chain of successful singles including "My Generation", "Substitute" and "Happy Jack". In 1967, they had their first US Top Ten hit with "I Can See for Miles". Two years later, they released their iconic rock opera album, Tommy, which included the single "Pinball Wizard" and was adapted into a film in 1975 – both of which were a critical and commercial success. The band's 1973 celebration of their mod roots, Quadrophenia, also had a film adaptation in 1979. In 1978, Moon passed away and later that year Kenney Jones (previously of the Small Faces and the Faces) took on his role in the band. Entwhistle also passed away in 2002. Today, Townshend and Daltrey continue to perform as the Who, touring regularly.